Camping St. Lambert är en camping i Millau, Aveyron, belägen i skogen och vid en flod/ en bäck. Campingen har platser med stängsel, med skugga, utan skugga och platser med lite skugga. Camping St. Lambert ligger i närheten av en sandstrand och en stenstrand. Det finns möjlighet att hyra tält och husbilar. På campingen finns en lekplats och ett sportområde. För den sportige semestervandraren har campingen olika cykelleder. Det finns ett underhållning. Campingen förfogar över en utomhusbassäng. I den närliggande omgivningen kan du också simma en flod/ en bäck. I Camping St. Lambert är det tillåtet att snorkla och åka forsränning/åka kajak/åka flotte. Denna inspektör gör varje år ett besök på Camping St. Lambert och inspekterar campingen för ca 200 faciliteter och för andra förekommande punkter. Inspektören är en medarbetare från ACSI och arbetar inte för campingen. This is an excellent campsite on the banks of the River Dourbie, about a mile out of the centre of Millau. On the way here you pass the more expensive campsites and this is the last one of about four sites. You get a warm welcome from Valerie and Thierry and there’s more than enough English spoken to make arrival easy. This may not sound like a big deal but believe me, Millau is a long way down and after the drive here, you’ll want things as easy as possible. It is not a big site and you could walk around the whole place in about 15 to 20 minutes. We had booked our pitch (no. 45) in advance. It was after all high season and we wanted a riverside pitch. The riverside pitches are of a reasonable size but if you have a large unit and like spreading out a little, you may struggle for space. The pitches are level and under trees so you get plenty of shade though there will be parts where you can also get the sunshine. I didn’t see any UK style hook-ups but we have a continental adaptor so this wasn’t a problem. I did see a box of adaptors behind the reception desk so it looks like they do have them for loan if you do forget yours. As far as I could tell, there is NO reverse polarity so don’t worry about it. There are several toilet and shower blocks as well as washing machines and washing up areas. They were cleaned regularly and everything was well looked after. Surprisingly for a French campsite, there was always a good supply of toilet roll. I have a slight disability so accessibility is important to me and at least one of the toilet/shower blocks had a ramp for wheelchair access. I did try the disabled shower but it was rather poor and I just used the ordinary ones from there on. The river is a wonderful place for swimming and having fun. You can access the river beach, a grassed area next to the river, directly from the site and it’s a safe place for younger kids. Older kids can get an inflatable and take them down the small rapid about 20 yards down. Our pitch was directly above these rapids and it was rather noisy. Not a noisy that would keep you awake at night but a noisy that meant that quiet conversations or quietly listening to music or the radio was near impossible. On looking around the site, there are some larger non riverside pitches that had much more space on them and were far enough from the river to avoid the noise but still near enough for quick and easy access to the river beach. If the river isn’t for you, there is also a nice swimming pool that is safe for swimmers and non-swimmers alike. Next to the pool is an ice cream hut, a bar area and a terrace where you can eat. The offerings are basic burger etc things but they were very nice. The reception has a small shop with some basic provisions, gas and a rather nice range of some locally produced wines at reasonable prices. There is also a range of leaflets and brochures for tourist attractions etc. The site itself usually had something or other going on most nights from magicians to meals with locally produced sausage. If you left the A75 at junction 45 and followed the main road to the campsite, you will have passed a large Casino/Geant supermarket, an Auchan and a Lidl. There is also a large Carrefour and LeClerc a few minutes drive away on the other side of town. All, apart from Lidl also sell fuel. There is loads to do in the area from paragliding to pony trekking and kayaking to caving. The old centre of Millau is also nice and make sure you go up the old belfry for a wonderful 360 degrees view of the town and the wider area. We also had a ‘back stage’ tour of the Millau Viaduct for 10 euros (a family ticket) and that was extremely interesting. One of the must do things is the Velorail at Larzac, about half an hour away. This is a great site. I would have no hesitation in going back to this site or the area. Vill du boka campingen Camping St. Lambert eller få mera information? Det går bra med nedanstående uppgifter eller via campingens webbsida. 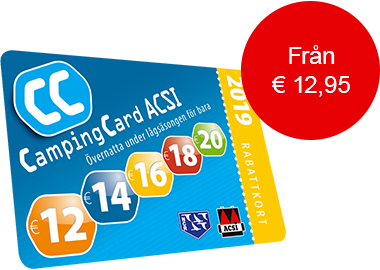 ACSI Eurocampings skickar din informationsförfrågan till "Camping St. Lambert".